I absolutely adored The Elegance of the Hedgehog, which is one of the first books that I reviewed for this blog. You can imagine my excitement, therefore, when I heard that the author had just released a new book. The fact that my local library had a copy available for this weekend meant that I was destined to read this book for the 24 hour read-athon. I did not enjoy this book as well as her debut novel, I think primarily because I really do not care for the main character – a pompous food critic who is on his deathbed spending the last hours of his life trying to discover the one food he wishes to taste before he dies – rather than spending quality time with loved ones that he will leave behind. I did, however, thoroughly enjoy the book and absolutely savored her detailed descriptions of taste sensations. I managed to read the book in one 2.5 hour sitting (it is only about 150 pages) and while I did not care for the characters, I did enjoy the author’s writing style. The book is told in several short chapters, from a variety of view points. Every other chapter focuses on our food critic and his quest through the recesses of his memory to find the ultimate taste sensation with which to end his life on earth. The other chapters detail a different point of view of those who will be left behind: his children, his wife, the doctor and others (even the family cat is given a chapter). I found that I would often skim through these chapters – not because they were not well-written, but because they were truly depressing. This man alienated himself from all who should have been important in his life. His own children did not care for him, and his grandchildren do not have fond memories. While our food critic had a refined palate and a talent for writing beautiful culinary prose, he hurt those who loved him the most. I am not sure that this story is for everyone, but I do know that it was for me. I truly love Muriel Barbery’s detailed writing style – and her diction is impeccable. I would rate this 3.5 out of 5 stars and I am looking forward to her third book, on which she is currently working. Been wondering about this one. Thanks for the review. Keep up the great reading!! I love raw tomatoes, not as crazy about them cooked. That one looks yummy. Thanks for playing Molly! Happy reading. 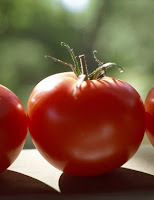 The book sounds wonderful and I love the passage about the wonderful tomato. My copy of this arrived from the States a couple of days ago (I prefer the cover, edition and title!) This is actually Barbery's debut novel; after the international success of her second novel, The Elegance of the Hedgehog, Gourmet Rhapsody was translated. I too loved Hedgehog, I think it's the best book I've read in years. I met her last spring, she is charming. I can't wait until the third book! I read this book in two different sittings (I had to read it at Borders because I didn't have the money to buy it), but I read it quickly, as you did. I really enjoyed it, but I agree that it was a rather down-in-the-dumps book. All the same, Muriel never fails to enthrall me. Thanks for the review!